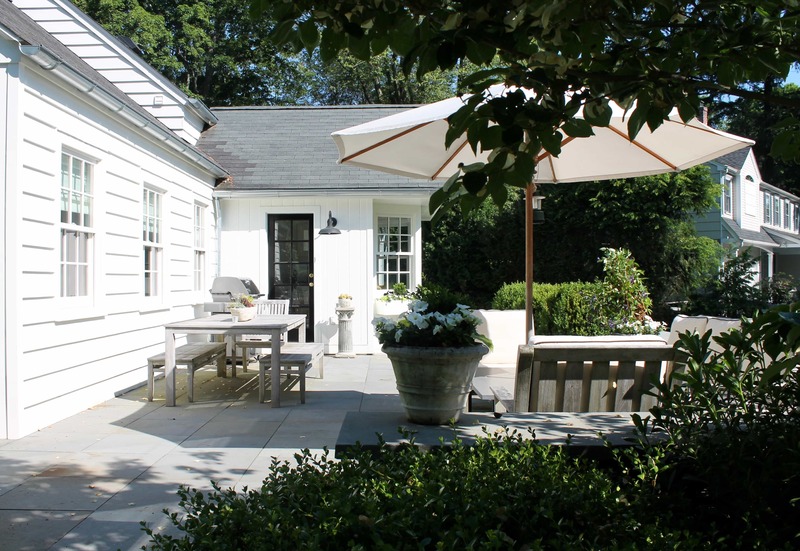 My friend Diane Karmen has the most beautiful modern farmhouse meets cottage style home tucked into a quiet corner close to town in Westport, Connecticut. Everything is in black and white and she has a mix of styles both inside and out. 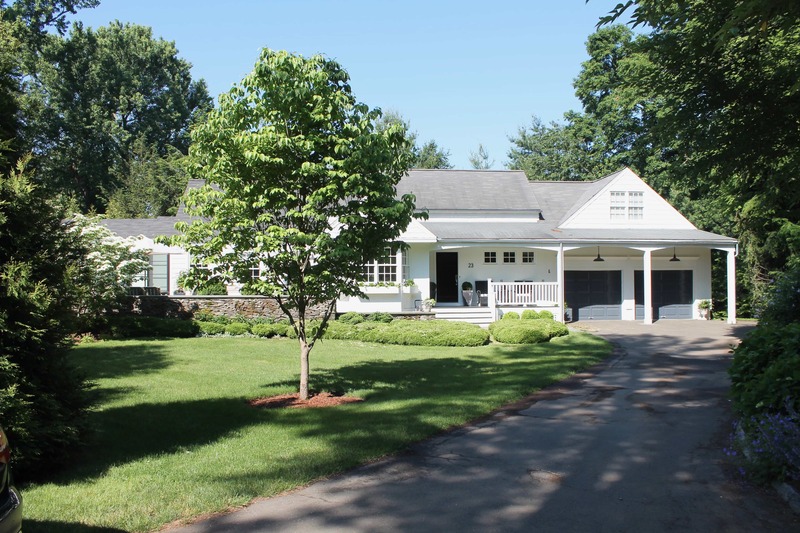 She blends zen with farmhouse-cottage seamlessly and has managed to create a stunning home inside and out for her family of four. Diane is an interior designer and her home will be featured in a magazine soon so I only featured her exterior–which is quite lovely and manages to showcase her mix of styles and how beautifully they can blend together to create a serene home from the moment you pull into her driveway. 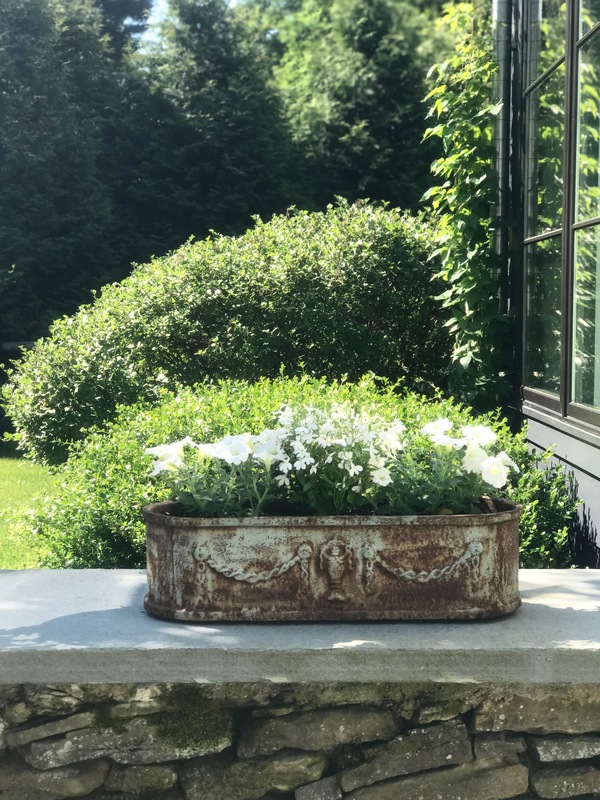 I love her vintage stone planter with all white flowers. 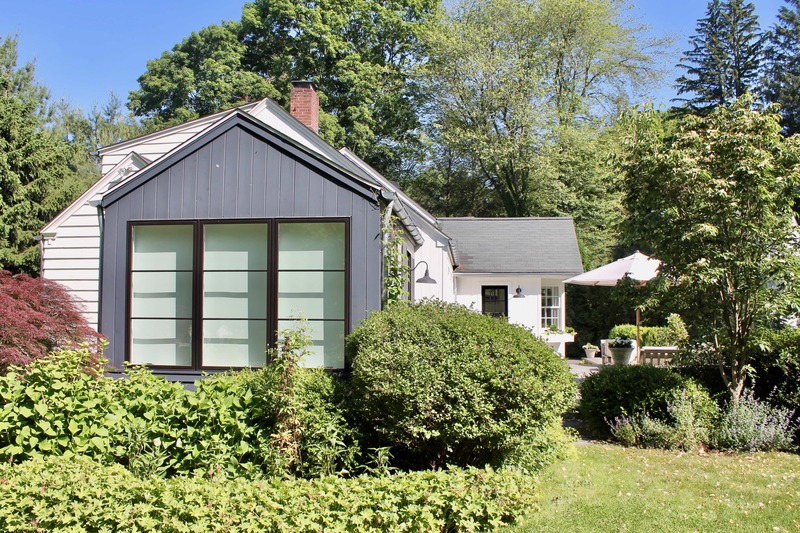 It sits on a stone wall against the gray siding of her sunroom. Diane has a simple teak table and benches that she has let go gray. 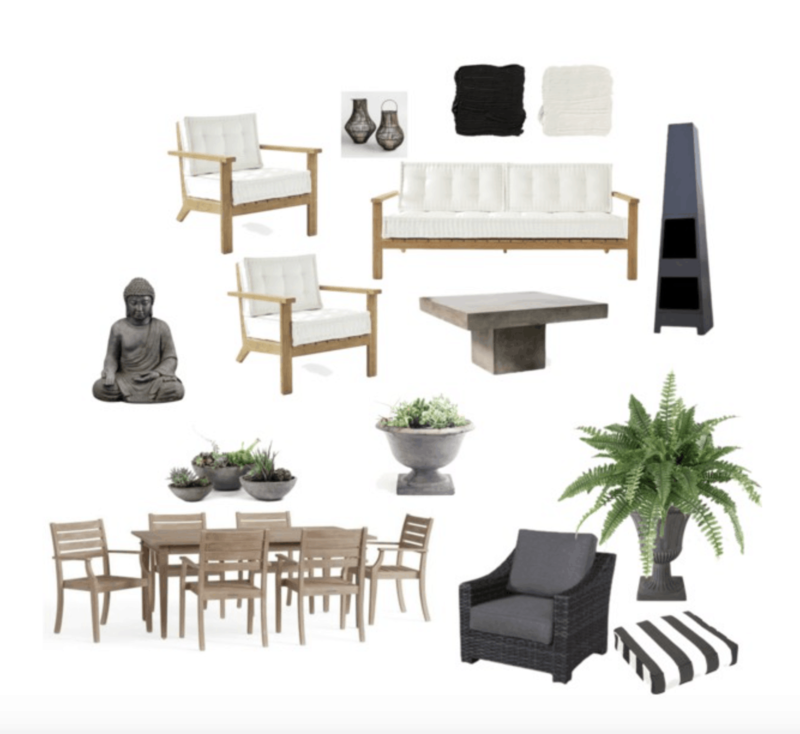 It fits her modern mix of styles beautifully with a concrete planter of succulents in the middle. 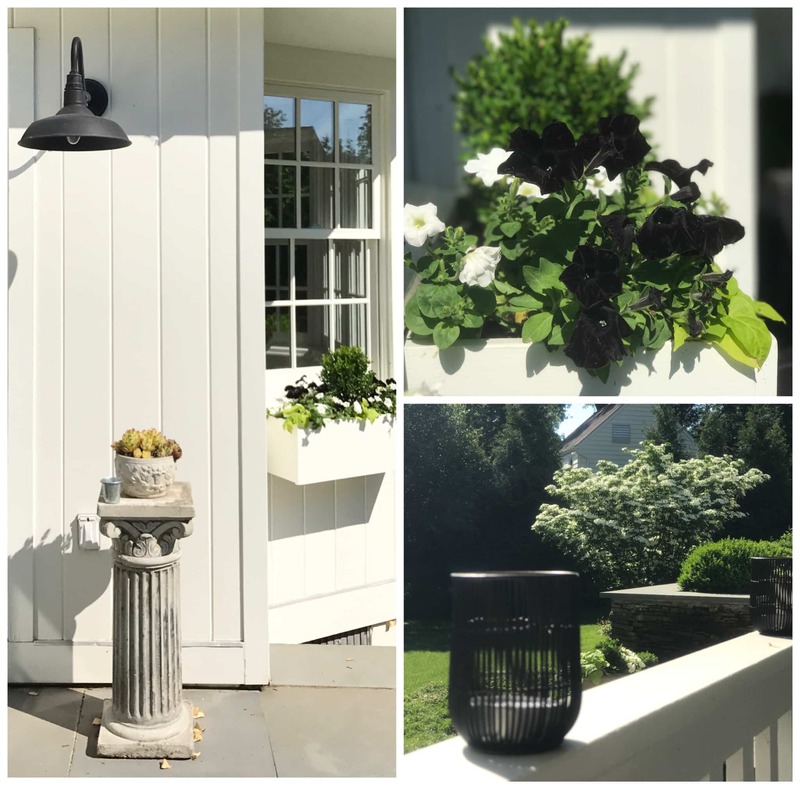 She uses a farmhouse light on vertical siding and below is an old column with a stone planter of succulents. 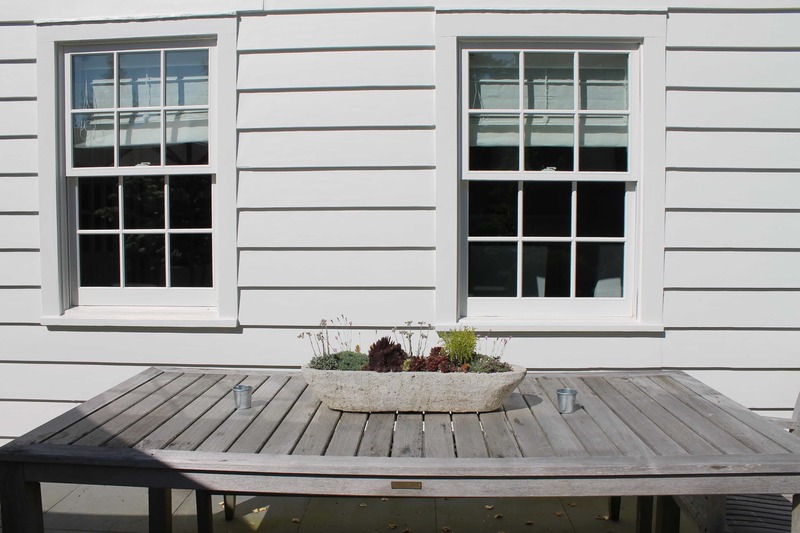 Her husband made the window boxes that contrast the column with straight lines and painted white to match the house. 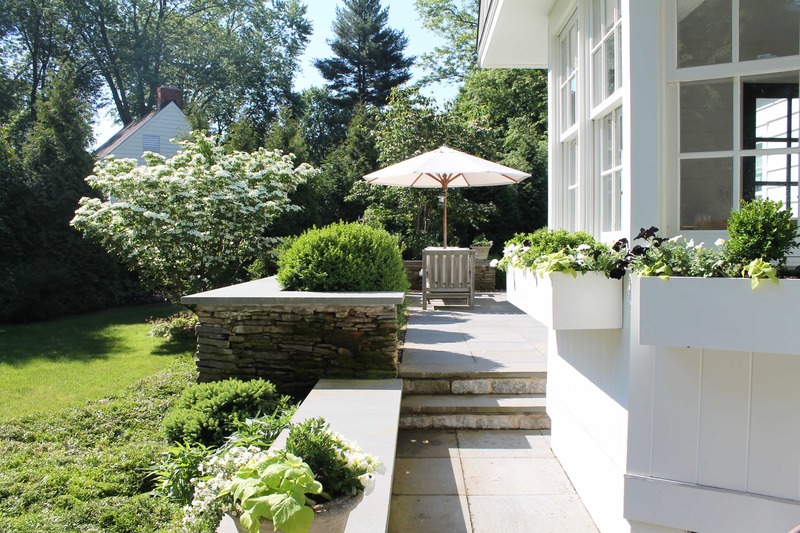 Plantings include boxwoods, potato vine and black & white petunias. Along her porch railing she has small modern votive holders. Her porch is stained black and has a hook for dry-cleaning deliveries above a stone urn planted with a Boston Fern. Her wicker chairs have black and white stripe cushions. In the corner of her seating area she has a modern outdoor fireplace. It gives off heat, plus helps keep the bugs away. 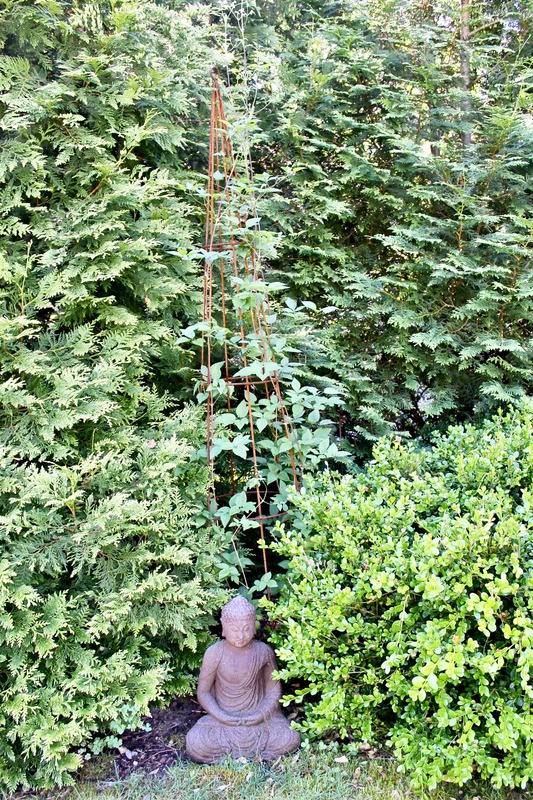 In every corner of Diane’s home and garden is a little surprise. She has left nothing untouched with her thoughtful and beautiful style. Thank you Diane for allowing me to take some time and enjoy the outdoor space that you have created. For more of Diane’s work, visit her here. 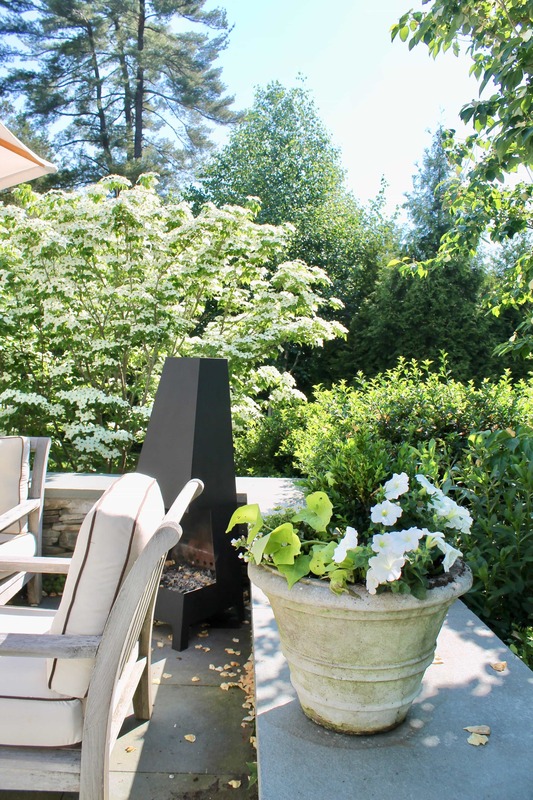 Diane created her outdoor space using a mix of modern and vintage to create a beautiful and inspiring outdoor space. I’ve linked a few items that are similar. The Cliffside Teak Sofa and lounge chairs from Serena & Lily. Or the Chatham Sectional from Pottery Barn. Dining table and chairs from Pottery Barn or this one from Serena & Lily. 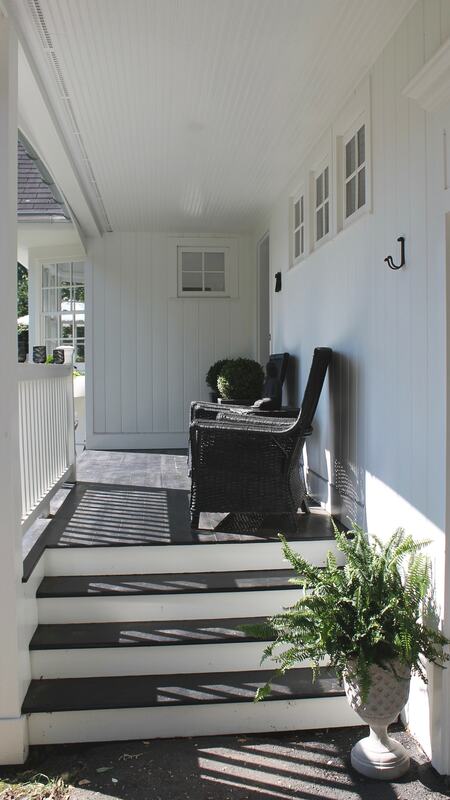 My go to white paint indoors and out is always Cloud White from Benjamin Moore. Diane used Raccoon Fur from Benjamin Moore for black. Stone planters, urns and statues throughout the patio and garden. Diane’s Chimenea is from Vermont, this one is similar. Today feels like a Colorado Summer day. Eighty-four degrees and low humidity–perfect for enjoying our patio! So beautiful! Love the new look of the blog, too, Annie! I hope you do an inside tour as well. This is so pretty! Me too! Thanks for reading Stephanie!